In a party I just love serving starter/appetizer...the guests work up their excitement every time the door bell rings ... one more champagn pop-opened; tens fingers digging in tidbits, pairs of feet up on the coffee table . Now I can't wait to see my sister-in-laws and their children at the Christmas dinner party this year! Since some ladies there watch their weight carefully, this vegetable-base terrine is particularly designed for them; it is choke-full-of-flavor while won't choke up our waistline. But, moderation is always the key. To make the terrine look more festive and special, I mold the pate, decorate it with vegetable and herb, add a shining agar jelly on top. Agar (photo on left) is extracted from seaweed so makes it vegetarian gelatin substitute. 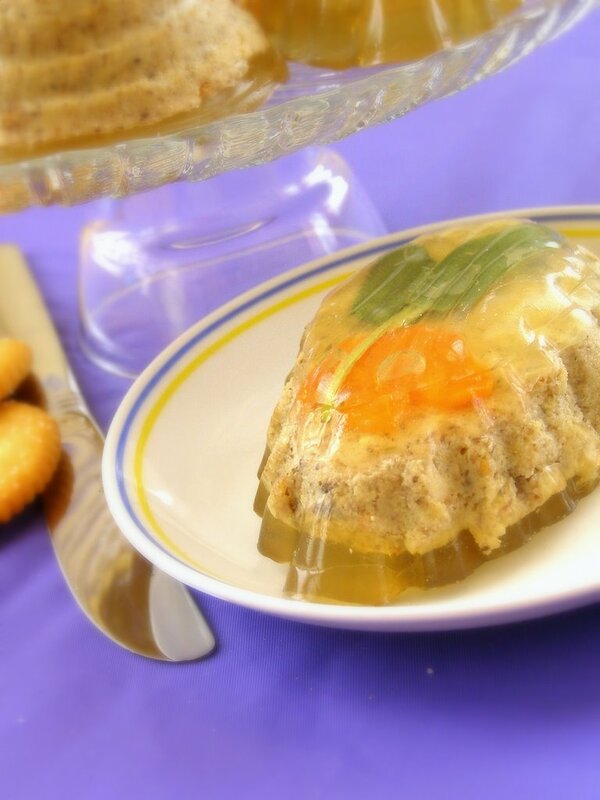 The word agar comes from the Malay word agar-agar, meaning jelly. 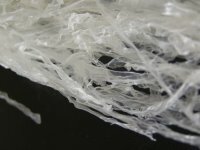 It is typically sold as packaged strips of washed and dried seaweed, or in powdered form. After dissolved in hot water and cooled, agar becomes gelatinous, just like gelatin except the latter is made from animal protein. Agar's widely used in making jello and desserts in Asia, and quite often in savory dish, so that is what I'm doing now. Any mushroom after cooked able to yield buttery texture would be good for this dish, like porcini, crimini , baby bella and white button mushroom, except the last one has not much flavor, still you can improve it by blending with other mushroom(s). Set the heat on medium to medium/high for a skillet, saute the onion and butter for 2 - 3 minutes, add garlic and fry for another minute. Add mushroom and a couple dashes of white wine, saute the mushroom over medium-low heat until it's soft. Add sage, season with Worcestershire sauce, salt and pepper. Turn the heat off. After the mushroom cooled off, drain or even squeeze out the liquid as much as you can. Save the liquid for making agar jelly. Puree the mushroom and the eggs. Taste and re-season if necessary. Combine the mushroom mixture with almond. It should have a good consistency like pate (add bread crumb if necessary), and can be simply served as it is at this stage. 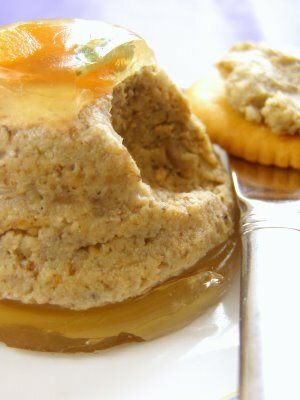 If you intend to dress up the terrine, fill the pate in a 8"x4" container. 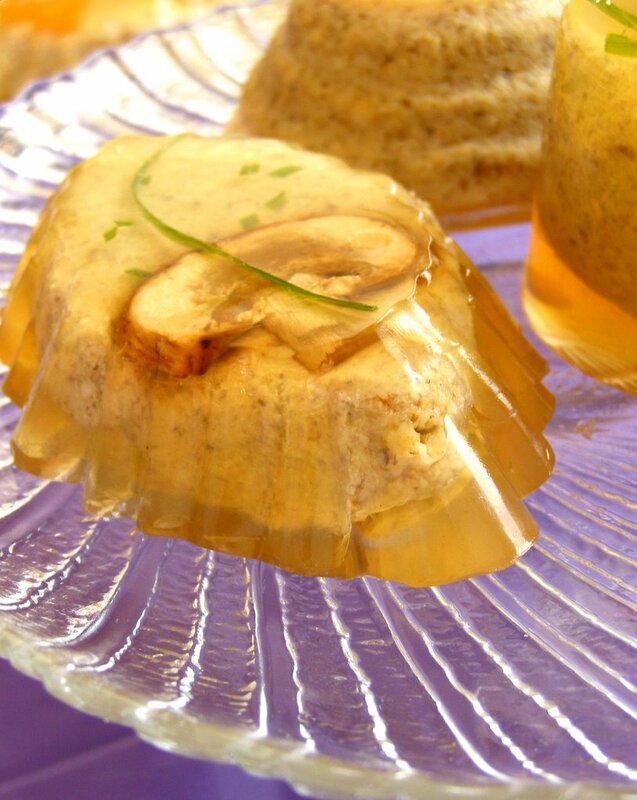 Or if you have time and want to make it very elaborated as the photo shown you, divide the pate into small portions according to the size of your tin, wrapped, keep them chill in refrigerator while you're proceeding agar jelly next. Ingredients for savory agar jelly: juicy from mushroom, about 2 cups vegetable stock, dried agar. Before you start boiling agar, set out the vegetable, herbs, and the tins. Now you can make the agar. Pour a tin layer of agar into tart tins, arrange the vegetable and herb, the previous layer of agar would be slightly set in 2 minutes, now add a little more agar to cover the decorations. Let it set (take about 10 minutes in a cool kitchen). Make another batch of agar again... in the meantime, fill the tins with mushroom pate, pour in agar and fill up to the top. Chill the terrine in refrigerator for half day. To unmold: in a shallow tray fill with warm-hot water, dip the tins in for a short while, unmold. If sliced mushroom is used for decoration, some dark liquid starts coming out after 2 days. The terrines look so lovely - and I love miniature food! They'll shine on any table. About the Blogger - I have received many e-mails from my friends (here in Brazil) complaining about the same problem. I don't know what it it, but it is bad!! Agar is a kind of gelatine,right? Dish looks great,I would like to try this.I like the pics too. Lot of people saying the same thing about not being able to leave cooments!If you haven't changed inti Beta,do it.It's easy.It went offline twice yesderday! What a wonderful appetizer for the weight-watchers :p Can I have one please? I have the same problem as you when leaving comments, but only for those blogs on Beta Blogger. To get around this, choose to leave comments under "Other" instead of "Blogger", and enter your name and blog address. But of course, the blog owner has to allow Anonymous/Other comment. Hope it works. I think it is a betta issue. I've been just signing in under "other" instead of my blogger name. Patricia, I feel very frustrated after I failed so many times in sending my comments to your beautiful roasted lamb! Asha, I'd rather define agar as gelling agent. Gelatin, to me, generally refers to the one made from animal protein. Thanks your compliement and the advise on Beta! Anh, please let me know if there is a way I can see the bloggers using beta version or not. You're on the way to somewhere (vacation?) Enjoy the trip! Angie, I've seen you (mmm... your fingers only, hehee), can tell you don't need to watch your weight :D... Can you please tell me how I find out I'm in beta account or not. Thanks pal! Rachel, I've signed as "other" and "anonymous" but no use... but will try one more time! Thanks! About the comments- when people change to beta, their login changes as well, I'm wondering if this is somehow part of the problem? Have you emailed blogger? Gattina- I love the look of terrines and can only imagine how wonderful these flavors are together. What a lovely party you will be having and isn't it fun to say agar-agar? Much better than "gelatin". gattina...the dish is beautiful..even Iam facing the same problem..I don'nt even know wheather this comment is recieved or not? Gattina, as far as I can tell, you are not in beta. When you log into blogger to post, at the Dashboard, did blogger say something like "Your Beta version is ready for upgrade". That's what I get. oh gattina, those terrines look wonderful!! I'm having those same problems leaving comments. And when it does let me leave a comment (with my gmail account) it shows my name as "kalyns" and doesn't link to my blog. I hate it. Anyway, on to happier thoughts. Your terrine looks just lovely. I adore mushrooms in anything. Love the lavender color too. Second, it seems lots of people can't comment anymore, including Jeff from C is for Cooking. How frustrating! I hope that Blogger fixes the glitch soon. I have to make something for tge New Year's day Party so this is a great idea! Angie, thank you my pal! Isn't frustrated? In the beta blogger home page doesn't mark with beta, after I read through their lovely post, click on comment (my eye wouldn't look at http naturally), go type-type-type my long whine comment, then type "publish"... oh volia... die lah! nabeela, I'm with you *grumble grumble grumble* but thanks for your sweet comment! Kalyn, oh that's another problem, actually I found it happened on Sher too! Oh thanks! But my camera is handicapped on purple and green (but very sharp to show red). I have to enhance its saturation at a photo software... that's why I don't use lavender/purple often. Ari, thanks for your comment. Is it the reason why you only can comment after you identify yourself as "anonymous" here? I am not if want to switch to beta blogger. There is a reason why it is 'Beta'. This is such a strong temptation for all of us to turn into vegetarians for life. Creativity thy name is Gattina ! this looks really yummy. yum yum. You always has a way to really entice my taste bud. Sandeepa, so happy to have your visit, thank you! Krithika, *LOL* oh I like what you said! Edith, after I took the tips from the friends here (check as "other") the problem doesn't exist. You may like to try. Me too, I can't get enough of your baked goods! All my friends, thanks for the tips! Now I'm checking in as "others", 99% sucessful in leaving comments. For those won't allow me, I may tell them by e-mail about the situation then. Thanks again! I've been so busy I haven't had time to check on my favorite blogs. I knew you would have something special--but holy cow!!!!!! Julia Child must be so happy (in heaven) looking at this. Magnificent, Gattina. Who wouldn't be amazed and delighted when you served them this? Beautiful photos! Just Amazing work of art on a plate!! gattina, your dishes are masterpieces never seen something so exotic ,how I wish I were there by the table to enjoy :) Happy weekend & cheers! It looks pretty but I am always a little pensive about eating savory food in essentially jello. It makes such a great presentation though! 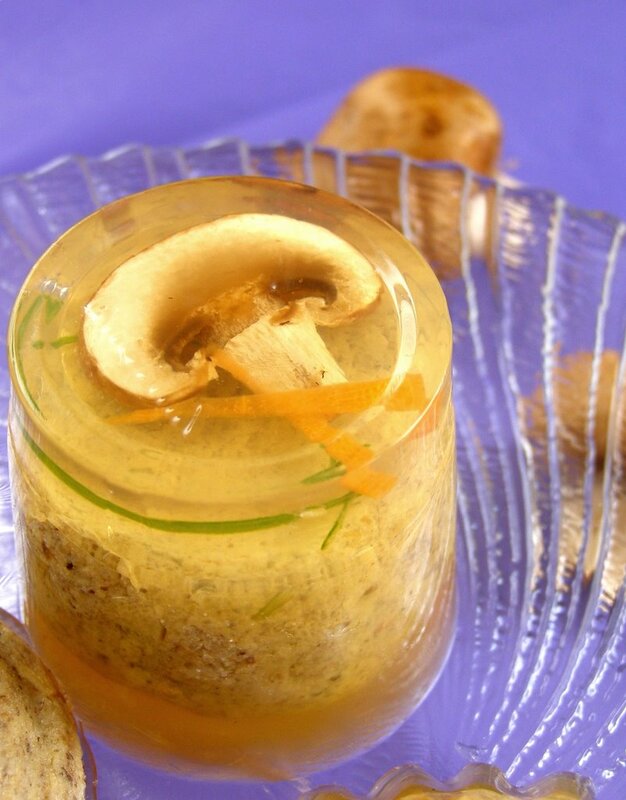 OOH!I have never tasted pate , somehow associating it with goose liver, but mushroom does sound very interesting. where do u get the tart tins?i have agar agar. Sher, don't worry about it, I know you must be busy with Upsie. This terrine afraid is too "lean" to Julia's liking, kekee..
Lera, same sentiment! How I wish I was invited to your dinner! Julia, you're always so sweet! Abt comments and blogger - I've left comments on blogs and they never show up or come up as anon. I'm hoping this will be solved soon. This looks interesting. They do a lot of savoury jellies in Poland and I've eaten quite a few there. Yours look similar but more "refined". Want to come to chez moi and make it for New Year's? Burgundy Wine lies at the very heart of France, and is one of the world’s finest wine producing regions. Located two hours to the southeast of Paris, the wine area starts in Chablis in the north of the region and then it follows the autoroute A6 southerly to Lyon. The Burgundy soil is mainly based on oolitic limestone, upon which both the Chardonnay and Pinot Noir grapes flourish. The red wines, made with the Pinot Noir, are more difficult to grow because these grapes are more sensitive to disease or to being badly handled. Towards the south of the region, from around Macon, the soil changes to a reddish granite schist and sand of the Beaujolais. Here, the Gamay grape flourishes, making excellent red wines, many of which are drunk while they are young. If you have not been to Burgundy, try it. It is a great part of France to visit for a holiday. Alternatively, stay at home and simply drink and enjoy the wine. This is such a winner! Perfect for a vegetarian lunch or a light dinner. You can use any variety of mushrooms. I like to include Portobellos because of their rich, deep flavor.